Celebrating Summer! 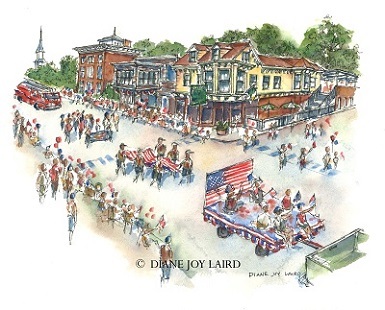 was painted in June of 2012 to commemorate the Fourth of July parade in Smyrna, Delaware. The original 8″ x 10″ painting is available for purchase. Please contact the artist for more information. Also available are limited edition prints and note cards. 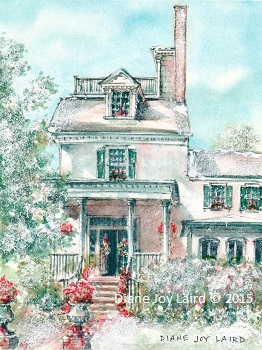 "Belmont Hall Greetings" is a winter scene adapted from "Belmont Hall (2015)" Smyrna, DE. Belmont Hall, a Georgian mansion built in 1773, is one of the most treasured and historic houses in Delaware. Surrounded by spacious grounds and beautiful gardens, Belmont is a beautiful place to visit! 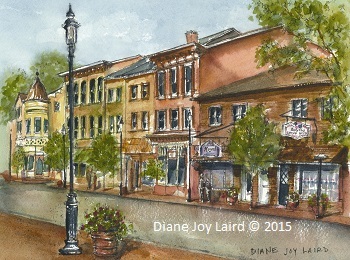 Prints and notecards are available on this website as well as in downtown Smyrna at Smyrna Cards & Gifts. 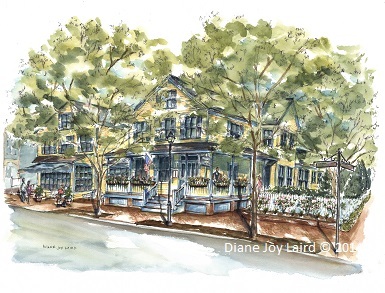 "Smyrna Main Street - 2015" features Smyrna Cards & Gifts, Royal Treatments, and The Inn at Duck Creek. The original painting was sold to Karen and Woody Gill, owners of Royal Treatments and Smyrna Cards & Gifts in downtown Smyrna. 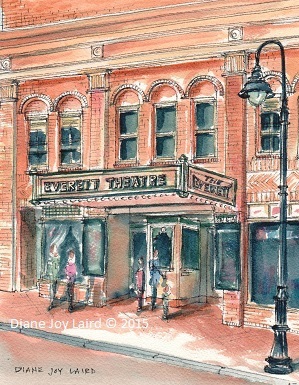 Prints and notecards and seasonal greeting cards are available at their store at 16 South Main Street, as well as on this website.